Taxonomy: Taxonomic level of the family. Synonym(s): dsDNA algal virus group. Genome: Virions contain 21-25 % nucleic acid. Virions contain one molecule of linear double stranded DNA. Total genome length is 250000-350000 nt. Double stranded DNA non-permuted. Termini have sequences with cross-linked hairpin ends. Genome sequence minus the hairpin has terminal repeated sequences; inverted terminal repetitions (ITR) (for at least 2000 bases). Guanine + cytosine ratio 40-52 %. Unusual bases are found (varying from 0.1-47 %). Special nucleotides found in genome, are 5-methyl deoxy-cytosine residues and N6-methyl deoxy-adenosine residues (in some DNAs). Morphology: Virions not enveloped. 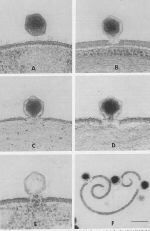 Virion attaches to host cell surface and releases DNA into the host cell in a similar fashion as tectiviridae. Nucleocapsids isometric. 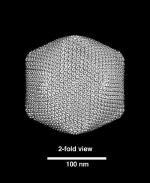 Capsid shell of virion composed of multiple layers (multilaminated capsid). Nucleocapsids 130-200 nm in diameter. Symmetry polyhedral. Nucleocapsids appear to be angular. Paramecium bursaria chlorella virus 1 (PBCV-1) Micrograph of vitrified PBCV-1. 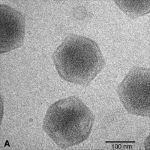 This image shows a well-defined outer capsid and a nonuniformly distributed interior mass. From the World of Chlorella Viruses, the web site for the Jim Van Etten lab at the University of Nebraska-Lincoln. Paramecium bursaria chlorella virus 1 (PBCV-1) PBCV-1 negativley stained with uranyl acetate (photograph kindley provided by Roger Hendrix). The smaller particles are lambda phage. Note that (i) long fibres are associated with the particles (small arrow), (ii) a distinctive 20- to 25-nm spike structure (large arrow) extends from one vertex of the particle, (iii) the particle appears to be packed asymmetrically, and (iv) an interior membrane appears to be located inside the capsid which extends to the unique vertex. Paramecium bursaria chlorella virus 1 (PBCV-1) PBCV-1 subjected to the quick-freeze, deep-etch procedure (photography kindly provided by John Heuser). Note the presence of flexible hairlike fibers, which appear swollen at their ends, on the surface of the particles. Paramecium bursaria chlorella virus 1 (PBCV-1) Side view of the particles attached to the cell wall. Note that the particles are attached to the wall via hairlike fibers, which appear to originate from the vertices of the virus. Photographs kindly provided by John Heuser. Paramecium bursaria chlorella virus 1 (PBCV-1) reconstruction Shaded-surface view of a three-dimensional reconstruction viewed along a twofold axis. Paramecium bursaria chlorella virus 1 (PBCV-1) reconstruction Shaded-surface view of a three-dimensional reconstruction viewed along a threefold axis. Paramecium bursaria chlorella virus 1 (PBCV-1) reconstruction Five trisymmetrons (highlighted in blue) surrounding a single pentasymmetron (highlighted in yellow). A pentavalent capsomer (uncolored) lies at the center of each pentasymmetron. Eleven capsomers form the edge of each trisymmetron (black dots). Photograph kindly provided by Tim Baker, Purdue University. Infection of Chlorella strain NC64A by PBCV-1. (A) Viral particle in close proximity to the alga. (B and C) Attachment of PBCV-1 to the algal wall and digestion of the wall at the point of attechment. (D) Viral DNA beginning to enter the host. 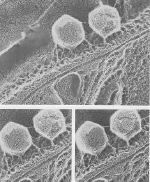 (E) An empty viral capsid remaining on the surface of the host. 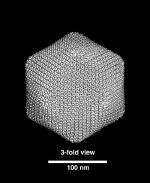 (F) PBCV-1 attachment and dissolution of a Chlorella cell wall fragment. Note that (i) viral attachment always occurs on the external side of the wall (i.e., the internal side of the wall curls inward) and (ii) DNA is not released from viral particles attached to wall fragments. The size markers in panel E and F represent 100 nm and 200 nm, respectively. Paramecium bursaria chlorella virus 1 (PBCV-1) infecting an algal cell Electron micrograph of the algae isolated from H.viridis. After incubation of the algae at 20°C for 20 h. Note the bursting cell that sets the Virus particles free. Paramecium bursaria chlorella virus 1 (PBCV-1) at cell surface Low voltage, high resolution scanning electron micrographs of PBCV-1 attached to Chlorella NC64A. The bar is 400 nm. 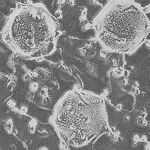 Paramecium bursaria chlorella virus 1 (PBCV-1) at cell surface Scanning electron micrograph of PBCV-1 particles attached to Chlorella strain NC64A. Photograph kindly provided by Kit Lee. © 1995-2007. D. Sander Established 5/95.